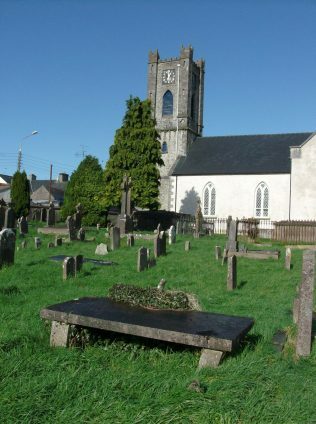 St Coman’s churchyard in Roscommon town was for more than a thousand years the parish cemetery until its closure in 1912. 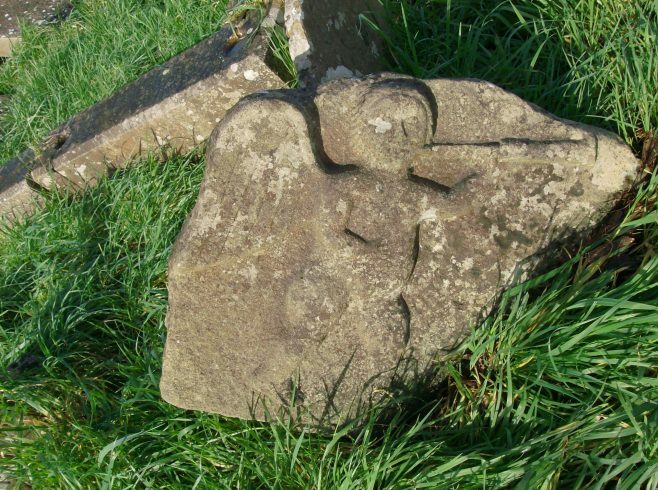 Surprisingly enough for a site associated with St Coman (c. 750 AD) there are scant remains of ancient buildings but some important pieces of sculpture from the Irish Romanesque (1000- 1169 AD) and the so-called ‘Joseph’ stone of c.800 AD have been discovered in recent years. The Church of Ireland now on the site is an amalgam of different phases of building and renovation since c.1600 and is known as St Coman’s Church. 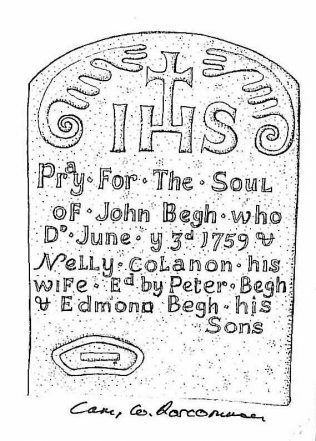 The purpose of this article is to record two headstones of 18th century date from this site along with a mention of others with similar affinities in Cam and the Strokestown area. On St Coman’s site the stones in question are No.1, an early 18th century slab with an image of Death claiming a mortal. It is what is termed a ‘warning stone’ and is a rare example of its type in Ireland. No. 2 is a stone depicting what appears to be an image of the Archangel Michael blowing the trumpet on The Last Day calling the faithful to Judgement. A brief description of the first stone is: It measures 75 cm high and 43 cm in width. A curvilinear border of C scrolls adorn the sides and top of the stone. Two cherubs adorn each side just below the top and the monogram IHS is set between them in the centre. 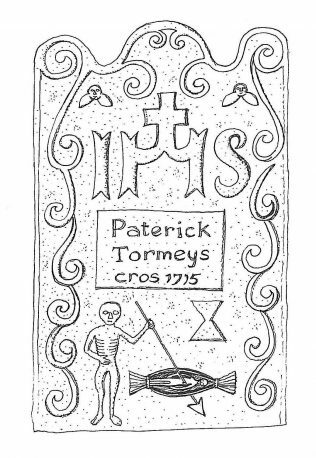 Below this is a rectangular panel with the words and date “ Paterick Tormey’s Cros, 1715”. Below this on the left is an emaciated skeletal figure with a spear in its left hand in the act of piercing the body of the figure in a shroud which is recumbent and open to reveal the figure. The shroud is tied both ends and an hourglass is seen with the skeletal figure, the usual appendage signifying death. Medieval images of death are sometimes depicted in the manner of that at Beaulieu, Co Louth where a cadaver figure is shown with all manner of insect and worm-like creatures feeding on the body. Hourglass images are common enough on 18th cent. memorials but the skeletal figure with spear is rare. In the Church of All Saints, North St, York is a 15th cent. stained glass window with scenes called the “Prykke of Conscience” based on a text written by the English mystic Richard Rolle in 1325 called “The Last Fifteen Days of the World”. The scene depicting the 14th Day when Death comes to claim all mortals has a broadly similar theme to the Roscommon headstone except in the former there are two mortals, man and woman, rather than a shrouded figure and Death has an upright spear. The second stone depicts what appears to be an image of the Archangel Michael blowing the trumpet on The Last Day calling the faithful to Judgement. It can be seen as a follow on to the warning stone theme as indicative of Resurrection and Judgement. It measures about 1 metre high but of rough trapezoidal shape. The figure of the Archangel is winged, face to the front and blowing his trumpet while his left hand holds it aloft. His right hand is bent at the elbow and placed across his waist. The legs are portrayed feet apart to show good balance in standing. The details are crudely carved but well enough to form who the sculptor had in mind. The Angel Gabriel is often depicted with a lily, shield , spear or trumpet. Known as the “Strength of God” he appeared to Mary to let her know she had been chosen to be mother of the Saviour..
Michael is one of the principal angels. His name was the war-cry of the good angels in the battle fought in Heaven against the enemy and his followers. Four times his name is recorded in Scripture. St John speaks of the great conflict at the end of time which reflects also he battle in Heaven at the beginning of time. He is the angel through whom God brought the Ten Commandment to his chosen people. Following a number of Scriptural passages, Christian tradition gives St. Michael four offices: 1. The fight against Satan. 2. To preserve the souls of the faithful from the power of the enemy, especially at the hour of death. 3. To be champion of God’s people, the Jews in the Old Law and the Christians in the New Testament, therefore he was patron of the church and of the Order of Knights in The Middle Ages. 4. To call away from earth and bring men’s souls to Judgement. The fact that the St Coman’s carved angel is found in a memorial context would lend credibility to the opinion of it being the Archangel Michael known as “Who is like God” rather than Gabriel because of its resurrection resonances (Gabriel is also sometimes depicted with a bugle, lily, or spear). The Roman and Greek liturgy call him Archistrategos, “highest general”. He had prestige as an angelic healer, a great heavenly physician. The Christians of Egypt placed their life giving river, the Nile, under the protection of St Michael. Well known is the apparition of St Michael (530-540AD) at his famous monastery in Gargano where his original glory of patron of war was restored to him. In Normandy, St Michael is the patron of mariners in his famous monastery at Mont-St Michael . He is said to have appeared there in 708 to St Aubert. St Michael replaced for Christians the pagan god Wotan to whom many mountains were sacred, hence the numerous mountain chapels of St Michael all over Germany. Michaelmas Day in Ireland and in some other countries, the 29th September, is one of the quarter days of the year for settling rents and accounts. Geese were often consumed as a celebration on this day. The cross of St Muiredeach, Monasterboice, co. Louth, has an interesting depiction of St Michael. In a last Judgement scene he is accompanied by the blessed and damned with angels, devils, clerks with books, and musicians, and St Michael is weighing a soul in the form of a tiny figure on the scales, where the devil tries to trip the balance. It is thought that the balance was introduced by Coptic artists who drew their inspiration from the pre-Christian Book of the Dead and is often seen on Egyptian hieroglyphics. On the Durrow High Cross in co. Offaly, there is a Christ in Majesty scene on one face of the cross. David the harper is beside a crouching bugler figure, perhaps meant to be St Michael. A resurgence of interest came in the cult of St Michael in the 18th and 19th centuries. One example from the Lough Derg area of co. Tipperary illustrates this concept: in Castletown Arra on a headstone dated 1828 there is a panel of Passion symbols along with a figure probably to be identified with St Michael. He blows the trumpet of Resurrection and holds the Scales of Judgement. A skeletal figure depicted is more likely to be the devil as he has an animal’s or demon’s head. St Michael appears to be competing for souls with the devil as appears on the Early Christian crosses at Monasterboice and Durrow. A number of other memorial stones depicting the trumpet of Resurrection and an unusual array of carved images also lie in a number of co. Roscommon burial grounds centring on the Strokestown-Tulsk area. They date from the early 19th century and have a symbolic way of depicting Death, Judgement and Resurrection . The trumpet on these stones is similar to the one at Castletown Arra having three ribs along the shaft of the instrument. 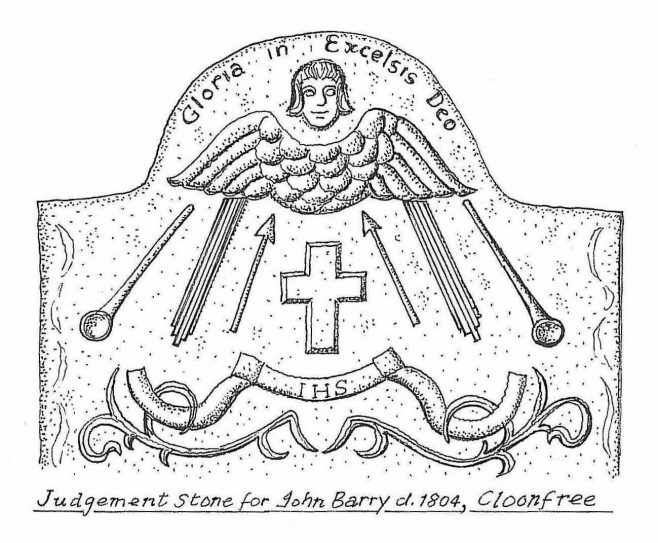 In a symmetrical arrangement on both side of the stone a trumpet, a folding measuring rule, (Judgement) and spear (Death) are in a sloping arrangement with a cherub above a Latin cross. Examples of these memorials which appear to have come from one workshop are found at Killina, subject: Peter McDermott, 1819; Lisonuffy, subject:Patrick Ternan, d.1805; Cloonfree, subject: Denis Barry, 1804; Toberelva, subject:John Connor, 1811. Kilmihil co Clare, the Church of St Michael, is an interesting ancient site of early Christianity being founded by St Senan about AD530 after a visit to Rome, and on his return wished to foster a devotion to St Michael the Archangel. Two churches in Elphin diocese are dedicated to St Michael, Croghan and Drumlion. Many people have admired the St Michael statue on the roof of Roscommon town’s Sacred Heart Church in its traditional pose of protecting the apse of the church. There now for over a century it is an ever present reminder of one of Christianity’s great symbols of Judgement. The writer would like to thank Mr William Gacquin for his views on the Cam memorial stone and Mr Jim Higgins, Heritage Officer, Galway for drawing the writer’s attention to the memorial stone in Fonthill cemetery, Galway City.